One day you open your bedroom closet and are disheartened to discover your expensive cashmere sweater has several small holes. You check through the rest of your clothes and soon realize many of your finer garments are similarly damaged. There’s only one explanation for the cause of this wardrobe calamity – clothing moths. Clothing moths can do thousands of dollars in damage in your closets and throughout your home if they’re detected too late. In addition to the ruined clothes that will need to be thrown out, you also might need to spend a lot on dry cleaning. And for particularly bad infestations of clothing moths, professional pest control services may be required. Basically, anything made from animal fibres and hair is favoured by clothing moths. Synthetic and cotton fabrics typically are ignored by the little pests, unless the materials include a blend of animal fibres. And the appetite of these moths goes beyond just clothing. Anything made from natural textiles, such as carpets, rugs, curtains, and furniture upholstery is susceptible to damage from clothing moths. The first sign you have a problem are those telltale holes in your clothing and also seeing adult moths flying around in your closets and home. The adult insects can be harder to spot because they’re only about a quarter-inch wide. They also have a brown colour, which makes them difficult to see in a dark space. These adult moths don’t actually eat your clothing, however – their larvae do the damage. The tiny caterpillars dine on your clothing over the course of the week-and-a-half period they’re in this stage of their life. The overall life cycle of clothing moths lasts between 2-3 months. If you do notice moths in your house, that doesn’t necessarily mean they’re clothing moths. In fact, it’s unlikely. There are thousands of moth species, but only two types that are categorized as clothing moths. The most common type is known as Tineola bisselliella. Clothing moths can enter your home on a piece of clothing you were given. Buying something from a second-hand clothing store can also transport the larvae into your home. Clothes moths don’t like light and are typically found in dark, warm spaces. Closet or wardrobe corners, the backs of closets, and up high on closet shelves are all common nesting spots for the insects. Disorganized closets with clothing clutter provide more opportunities for them to find a textile that suits their diet. Warmer spring temperatures can also help clothes moths thrive, especially if it gets unseasonably warm quickly. Keeping your home clean and organized is one of the best ways to minimize your risk of getting clothing moths. Vacuum and clean your entire home regularly and make the effort to give it an even deeper cleaning twice a year. And be sure to pay particular attention to your cupboards and closets. If your closets and home contain less clutter, you’ll be more likely to tackle cleaning tasks on a regular basis. And you’ll be able to clean more thoroughly, such as vacuuming underneath furniture and getting to your closet’s darkest corners. It can be a lot of work, but emptying your closets every few months and shaking out your clothing outside can help reduce a future problem with clothing moths. Do this task during the day, as the moths and larvae hate the light. It’s imperative that anything purchased from a vintage or second-hand clothing store be washed as soon as you get home. Run the clothing through a wash cycle in 100-120 degree hot water to kill any possible active moth larvae. Borrowed clothing, even from a close friend or family member, also puts you at risk for introducing clothing moths into your home. Remember, it only takes one infested item to cause a huge headache later on! Leaving dirty clothes lying around can also attract this particular type of moth. It goes without saying that sweaty clothes and clothing with food stains should be dealt with sooner, rather than later. If you have left some dirty clothing sitting around for longer than may be advisable, also wash them in 100-120 degree hot water, just to be safe. Mothballs are probably the first thing that comes to mind as a way to prevent getting clothing moths. While they can be effective as a way to repel and kill moths, mothballs need to be utilized properly to deliver the best results. Nowadays, mothballs can be found in more pleasant aromas (like cedar and sandalwood) than the icky traditional moth ball smell that seemed to permeate any item the smell came in contact with. Cedar-lined chests are another popular solution for protecting against clothing moths. The drawback of mothballs is that they need to be used in an airtight container or bag to be effective. You also have to use the right amount of them to deliver a high enough concentration of the moth repellent. They can also lose their potency after awhile and need replacing. Another big drawback of mothballs is their toxicity. They’re essentially a pesticide, so you need to take care with how you use them and handle them. Toxicologists recommend wearing gloves and adhering to the manufacturer’s guidelines when handling moth balls. Or you can use chemical-free mothballs, which are a little pricier. The pheromone strip is a clever and effective newer method for preventing clothing moths from breeding. The strip lures male moths with a female moth pheromone in powder form that sticks to the males. The strip, also known as a moth trap, effectively cuts off the breeding cycle, as the male moths now appear to be female to any other moths. Pheromone strips are a safer, non-toxic alternative to mothballs that only cost around $10-15. 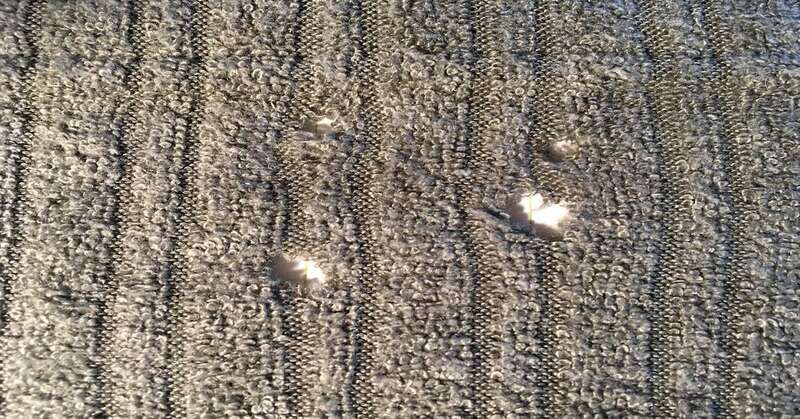 It’s the clothing moth larvae that leave holes like these in your clothing. One way to prevent moths from ruining your delicate clothing is to store them safely in airtight plastic containers and vacuum-sealed garment bags. Just make sure your sweaters or finer fabrics being stored this way have been properly washed or dry cleaned first. Naturally, you’ll want to do this with items of clothing you won’t be wearing for awhile, such as with a cashmere sweater during the year’s warmer months. Scientists are somewhat skeptical of its effectiveness in warding off clothing moths, but some people swear by dried lavender as a moth deterrent. Typically, the lavender is sold in small bags that can be put in closets, drawers, cupboards, and pantries. Along with their pleasant smell, lavender is also a natural way to potentially keep moths away. What if I already have clothing moths? 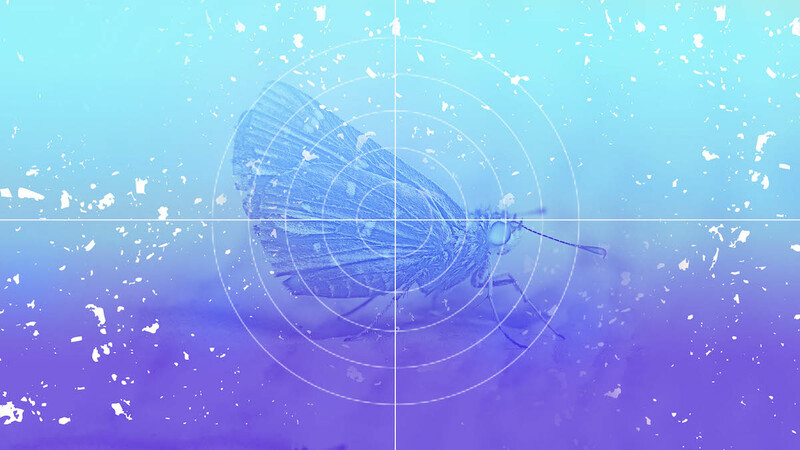 If your wardrobe is already showing signs of noticeable damage from clothing moths or you can see them flying around, you’ll need to enter elimination mode, as opposed to prevention mode. Depending on the severity of the infestation, professional services may be required to completely rid your home of the pests. If the problem is more manageable, you can take a few measures to tackle the problem yourself. Using any of the tips above should help you to clean up your moth problem. Most importantly, give your home a thorough cleaning and shake out all your clothing outside. An additional way to kill moths or larvae that you know are on certain items of clothing is to use the freezing method. Put the clothing in plastic bags, leave them in the freezer for a week, and any signs of life on the clothing should be gone. It’s a little unconventional, but it’s a method that works. A closet that’s kept tidier with an high quality closet organizer makes it easier to detect the early warning signs of possible clothing moths. Whether it’s your closets or other areas of your home you’d like to keep cleaner and more organized, schedule your free in-home consultation with one of our design experts.